Purpose of Treatment: The Infrared Sauna is a full-body detoxification treatment. Infrared energy is a spectrum of light that we perceive as heat. The sun produces most of its energy in the infrared segment of the spectrum. The infrared is divided into three segments by wavelengths. Only far-infrared penetrates organic substances (such as the human body) two or three inches deep so that the warming effect is very uniform. Infrared rays heat your body without having to heat the air in between, through a process called conversion. Because infrared rays penetrate the body over 1-1/2 inches through conversion, there is a deep heating effect in the muscle tissues and internal organs without putting too much burden on the heart. The body reacts to the increased heating through the natural cooling process of perspiration. Through perspiration, waste residue (toxins, sodium, alcohol, nicotine, cholesterol, and heavy metals) is removed from the cells (especially zinc, lead, nickel, calcium, etc.). As the pores of our skin open and discharge waste products, the skin sheds old cells, leaving it glowing and immaculately clean, with improved tone, elasticity, texture, and color. Deeply penetrating heat also stimulates the heart to increase blood circulation, which improves many symptoms. 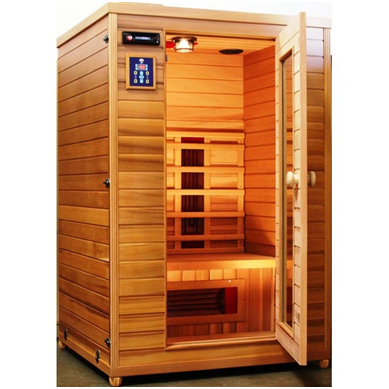 The Infrared Sauna is completely safe to use. Health professionals have used infrared heat lamps for decades to treat muscle and joint problems. In hospital baby care units, incubators are often equipped with infrared heating systems to keep newborn babies warm. Whereas conventional saunas transfer heat by circulating hot air, thereby warming your body from your head down, the far infrared heat rays warm the body directly. This allows an in-depth heat in a more pleasant temperature, thus providing more health benefits and a comfortable environment.